In front of me a DT50 guitar amplifier. The problem is that the unit works fine for minutes or hours and then plops and starts to hum at 50hz. The result is no sound. The tubes are goed and they stay on. After some searching i found the +5Volt_pot is gone. You can find it next to the digital volume chip MPC4241T. Further investigation tells me that the power comes from the voltage regulator U1 so this might be the problem. After some extra tests this was not the case. The voltage regulator is fed with 9,5Volt by the diodes 1N4002: D26, 27 28 and D29. D27 was defect and sometimes lost conductance. After spraying with cold spray it started working again. I changed them with new ones (i replaced all of them) and the voltage regulator to be on the safe side. Now it works again. Hope this may help others. 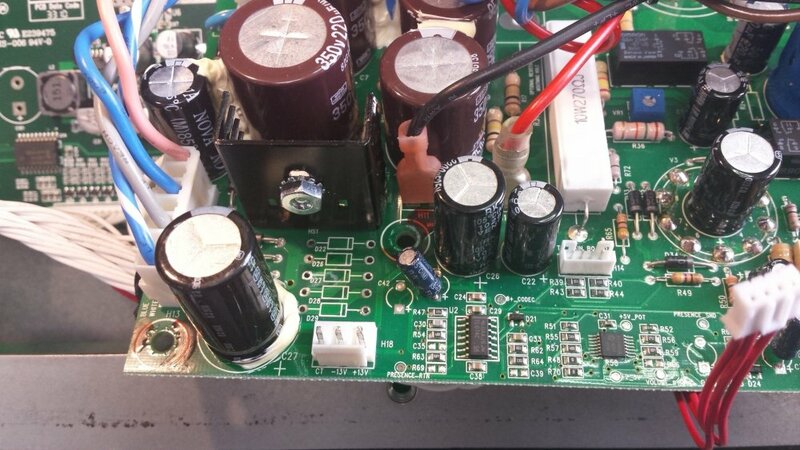 (picture shown power supply section with diodes removed.